Radiology uses X-rays, radioactive tracers and ultrasonic waves to detect, diagnose and guide treatment of numerous diseases and injuries. The discovery of the X-ray started radiological imaging, while continuing developments in technology, computers and science are further advancing the capability to view the body's inner structures, tissues and organs. Advanced diagnostic and imaging technologies are available to both inpatients and outpatients at the Outpatient Imaging Center, which is connected to Manatee Memorial Hospital. The Imaging Services department uses X-rays, radioactive tracers and ultrasonic waves to detect, diagnose and guide treatment of numerous diseases and injuries. For scheduling a procedure at the Outpatient Imaging Center, please call 941-745-7391. The catheter-based procedures are designed to reduce some of the risks and recovery time found in traditional surgical approaches. Among the many benefits of catheter-based interventions are shorter hospital stays, reduced recovery time without the pain of a large incision, and less visible surgical scarring. For acute stroke interventions and for a full complement of interventional radiology procedures, the new system will enable physicians to complete procedures in less time and help patients recover more quickly. There are various radiological procedures available at Manatee Memorial Hospital. Interventional radiology is a subspecialty of radiology in which physicians use imaging equipment to perform minimally invasive procedures for both diagnostic and treatment purposes. Interventional radiology is used to treat blockages inside arteries and veins, block off blood vessels that nourish tumors, destroy malignant tumors using focused heat and freezing, drain blocked organ systems such as the liver, gallbladder and kidney, and perform biopsies that would otherwise require surgical exploration. An X-ray image is produced when a very small amount of radiation passes through the body to create an image on sensitive digital plates on the other side of the body. The ability of X-rays to penetrate tissues and bones depends on the tissue's composition and mass, and the difference between these two elements creates the image. Contrast agents, such as barium, may be swallowed to outline the esophagus, stomach and intestines to help provide better images of an organ. Computed tomography, also known as a CT or CAT scan, generates detailed images of an organ by using an X-ray beam to take images of many thin slices of that organ and joining them together to produce a single image. The source of the X-ray beam circles around the patient and the X-rays that pass through the body are detected by an array of sensors. Information from the sensors is computer processed and displayed as an image on a video screen. The CT scanners at Manatee Memorial have earned accreditation from the American College of Radiology (ACR). Computed Tomography Angiography (CTA) uses a CT scanner to noninvasively produce images of vessels. Iodine is a contrast material that may be injected into a vein using a small intravenous needle, eliminating the need for an invasive catheter placement. This type of exam is has been used for arterial diseases such as aortic dissection, carotid stenosis, aneurysms and vascular disease of the kidney. 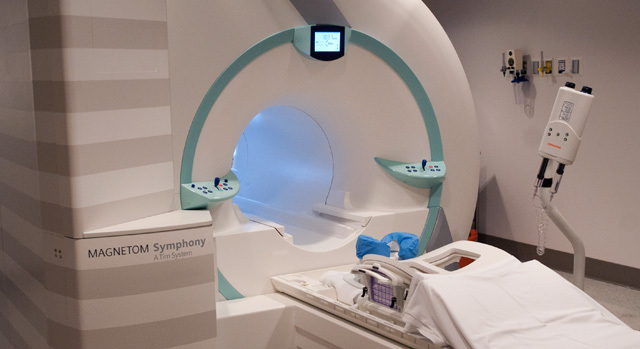 Magnetic resonance imaging (MRI) uses radio waves and a strong magnetic field to create clear, detailed images of internal organs and tissues. Since X-rays are not used, no radiation exposure is involved. Instead, radio waves are directed at the body's protons within the magnetic field. This exam takes 30-50 minutes on average and consists of several imaging series. Most studies will require a small intravenous injection of a contrast agent that usually contains the metal Gadolinium. MRI contrast does not contain iodine, an element used in other contrast agents for X-rays or CT scans, so it may be safer for patients who are sensitive to iodine. Manatee Memorial Hospital's Nuclear Medicine Department uses the advanced technology of nuclear medicine imaging to obtain detailed images of the body and helps identify disorders and disease. Nuclear medicine offers unique diagnostic information about the function of many organs in the body and is a way to gather medical information that may otherwise be unavailable, require surgery or necessitate more expensive diagnostic tests. High frequency sound waves are used to see inside the body. A transducer — a device that acts like a microphone and speaker — is placed in contact with the body using a special gel that helps transmit the sound. As the sound waves pass through the body, echoes are produced and bounce back to the transducer. By reading the echoes, the ultrasound can produce images that illustrate the location of a structure or abnormality, as well as provide information about its composition. Ultrasound is a painless way to examine the heart, liver, pancreas, spleen, blood vessels, breast, kidney or gallbladder, and is a crucial tool for obstetrics. A bone density test determines if you have osteoporosis, a disease that causes bones to become more fragile and more likely to break, and makes it possible to know your risk of breaking bones before the fact. Osteoporosis is a silent disease. People may not know that they have osteoporosis until a sudden strain, bump, or fall causes a bone to break. Bone density tests are usually done on bones that are most likely to break because of osteoporosis. Manatee Memorial has been designated a Lung Cancer Screening Center by the ACR. The ACR Lung Cancer Screening Center designation is a voluntary program that recognizes facilities that have committed to practice safe, effective diagnostic care for individuals at the highest risk for lung cancer. Manatee Memorial is a participant in the ACR's General Radiology Improvement Database (GRID). GRID collects process and outcome measures for the general practice of radiology and compares the results to similar facilities to help facilities establish benchmarks for quality improvement. Manatee Memorial participates in the Dose Index Registry (DIR), a data registry that allows facilities to compare their CT dose indices to regional and national valves. Information related to dose indices for all CT exams is collected, anonymized and transmitted to the ACR and stored in a database. Institutions are then provided with periodic feedback reports comparing their results to body part and exam type to aggregate results.